For decades American students have lagged behind other nations’ science and mathematics competitors on standardized tests. The gap has widened and is a source of concern in education today. We live at a time in history in which scientific discoveries, and their applications, profoundly influence all of our lives. From medicine, to communication and transportation systems, to genetic engineering and agriculture, we live in a world dependent upon science. The use of the scientific method is causing the rate of growth in knowledge to accelerate at an ever-increasing pace, thereby making an understanding of the methods and findings of science more important than ever before. Unfortunately, numerous studies have shown that the average American citizen is scientifically illiterate; they are incapable of understanding scientific advances or their implications at any level. Of particular concern is the fact that four out of five (78%) college graduates in the United States are considered scientifically illiterate, in spite of having completed at least two science course while in college. 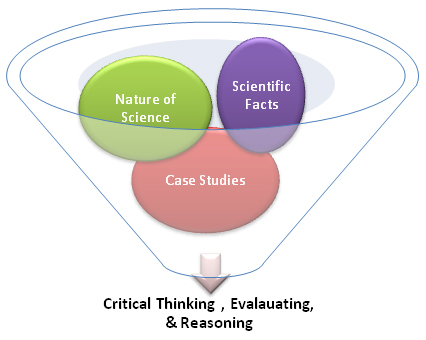 Scientific literacy includes knowledge of scientific facts and the nature of scientific reasoning, which use both critical thinking and empirical evidence to evaluate information. As with the issue of basic knowledge of scientific facts, many Americans do not understand the significance and importance of this aspect of science and how it pertains to them on a personal level. Many Americans seem unaware that the scientific method, with its dependence on the use of critical thinking and evidence, provides a proven method for not only enhancing our understanding of the world, but for informing our personal decisions as well. Scientific thinking isn’t ‘just for scientists; it’s for everyone’ – including college students. Well-developed reasoning skills can enhance student performance in college because they are fundamentally important to integrating and understanding concepts and relationships discussed at the college-level. In addition, employers value critical thinking skills in employees because these skills are useful in decision-making. Lastly, scientific literacy and critical thinking are fundamentally important to society because citizens cannot make informed, rational decisions about science-related issues if they do not understand the nature and significance of science. The current method of teaching science, which is widely used in colleges across the country, has largely failed to teach these things. Sam Houston State University has taken a proactive stance by developing a new type of science course that attempts to address these issues through a novel approach. This 4-credit hour course uses the analysis of extraordinary claims as the vehicle for teaching both science facts and critical thinking skills. The course, which is fun and interesting for most students, as well as intellectually challenging, serves as a foundation course for other science courses in the curriculum. Furthermore, the critical thinking abilities that students learn in the Foundations of Science course transfer to their other courses, thereby enhancing our students’ overall learning and academic success.